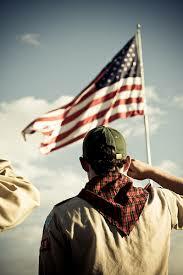 By giving your word you are promising to be guided by the ideals of the Scout Oath. against your own high standards and don't be influenced by peer pressure or what other people do. Your family and religious leaders teach you about God and the ways you can serve. You do your duty to God by following the wisdom of those teachings every day and by respecting and defending the rights of others to practice their own beliefs. of government and your responsibilities as a citizen and future voter. and you will respect yourself. you are doing your part to make this a better world. Do a good turn. anything else that can harm your health. role you play in it. actions, and remain faithful in your religious beliefs. The values you practice as a Scout will help you shape a life of virtue and self-reliance. 1. 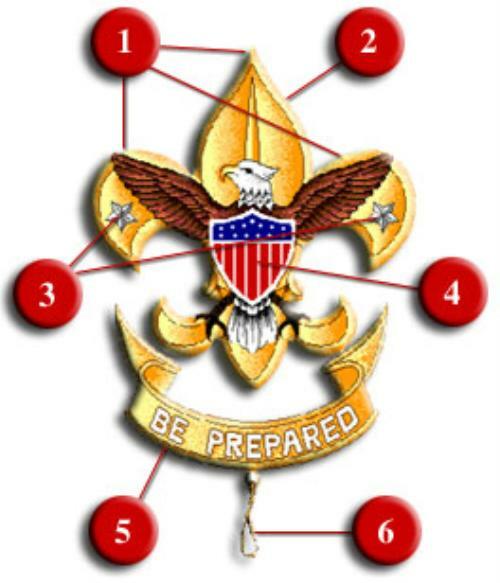 The three-point design of the top half of the badge is like the north point of the old sailor's compass.The main part of the badge shows that a Scout is able to point the right way in life as truly as the compass points it in the field. 2. The three points, like the three fingers in the Scout sign, stand for the three parts of the Scout Oath to which a boy pledges himself as a Boy Scout. 3. The stars symbolize the ideals of truth and knowledge of the Scouting movement. They guide you by night and suggest a Scout's outdoor life. 4. The eagle with the shield is the national emblem of the United States of America. It stands for freedom and readiness to defend that freedom. 5. The scroll with the Scout motto is turned up at the ends to suggest the corners of a Scout's mouth raised in a smile as he does his duty. ...for all. ... for every person in the country - you and every other American.